The year is 1881. In September, U.S. President James Garfield has unexpectedly died due to complications from a thwarted assassination attempt that occurred in July. A day later, Chester A. Arthur is sworn in as president. The population of the United States is just north of 50 million people, and the country consists of 38 states. This same year, a Spanish man and his young son will set foot on a ship bound for New York. Though the man speaks no English, he carries with him $40,000 and his ticket to success — his extensive knowledge of a medieval construction technique that he will introduce to the American architectural community. In the following decades, his method will be utilized on hundreds of prestigious buildings across the United States and transform him into a true American success story. While his name is not well known, his work and legacy graces hundreds of buildings across the United States. Born into a large family in 1842 in Valencia, Spain, Rafael Guastavino Sr. (pronounced "gwah-stuh-veeno") at first desired to be a musician but showed an aptitude for architecture and began pursuing his passion as a teenager. With the help of a wealthy uncle, he was able to further his education in Barcelona, eventually graduating with the title of "master builder." Guastavino's training had stressed practical, hands-on building techniques and led to his use of tile vaulting, a traditional technique that was common in his Spanish region of Catalonia. Tile vaulting, a masonry construction method, uses multiple layers of thin ceramic tiles and mortar to create an arched structure, such as a ceiling or dome. This quick and economical building system was a way to replace the stone vaulting method traditionally used in buildings, which was time-consuming, labor intensive, heavy and expensive. After finding success by incorporating tile vaulting into many of his building projects in Barcelona, Guastavino left Spain, never to return, on a mission to bring the region's tile vaulting technique to North America. By the 1880s, construction methods in the United States were undergoing a transformation. Safety was a top concern, especially after several devastating fire incidents such as the Great Chicago Fire in 1871 that burned more than six square miles of the populous American city. The demand for improved safety standards fueled construction innovation and paved the way for Guastavino to introduce his fireproof tile vaulting technology to the architects of the time. He soon found his footing as a vault builder, rather than an architect in charge of designing an entire building. In 1885, Guastavino filed three patents and ushered in an era in which his company dominated the field of tile vault construction. The burgeoning Beaux Arts architectural movement in America was a perfect match for Guastavino's impressive and graceful tile vaulting system. Beaux Arts, with its use of artistic craftsmanship and elegantly ornamented classical style, could be matched in spectacle by Guastavino's elaborate tilework designs. Major success for Guastavino's expanding company soon followed, including the design and construction of tile vaults for the Boston Public Library, now considered one of the most influential projects of Guastavino's career. By the early 1890s, the Guastavino Company was simultaneously working on major projects in Boston, New York, Chicago, Minneapolis and Providence. It was in the city of Providence, Rhode Island that the Guastavino Company first collaborated with the esteemed Beaux Arts architectural firm of John Carrère and Thomas Hastings, signaling the beginning of many partnerships between the two companies. One such collaboration would have an enduring impact on Capitol Hill. At the turn of the 20th century, the population of the United States had grown to more than 76 million people and a total of 45 states. The U.S. Capitol Building in Washington, D.C., was bursting at the seams with 391 members of the House of Representatives. With severely limited office space in the U.S. Capitol, most members worked at their desk in the House Chamber. 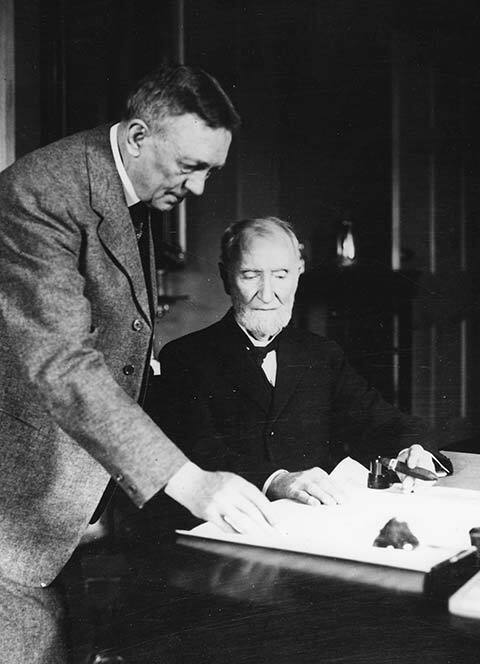 Superintendent of the Capitol Building and Grounds Elliott Woods (left) and Speaker of the House Joseph Cannon oversaw the development and construction of the first House office building in the early 1900s. Continuing their Beaux Arts design tradition, Carrère and Hastings created an elegant yet deferential design with an interior rotunda that functioned as the building's main lobby. Ringed by 18 Corinthian columns supporting a coffered dome, this grand circular vestibule was an unexpected but compelling welcome to visitors and members alike. Located on the first floor of the building (now known as the second floor), the rotunda required a structurally sound dome below that could handle its load of stone and plaster. There seems to have been no debate among the architects: the Guastavino Company would be the perfect fit for the job. While records of the Guastavino Company's work in the Cannon Building are sparse, the Guastavino name can be found on a number of the original drawings. 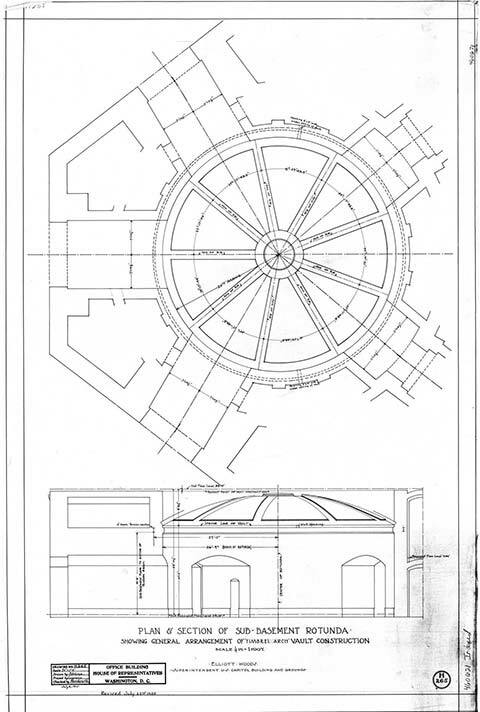 The plans called for a sub-basement (now basement) rotunda with a "timbrel arch" vault ("timbrel" being the name coined by Guastavino to distinguish his patented tile vaulting design). Full-fledged construction of the building commenced in 1905 and while few records of the Guastavino arch's building process exist, archival photos taken on March 28, 1907, show the construction of the Guastavino Company's wooden arch forms spanning the sub-basement level. A July 1905 section drawing showing the general arrangement of the "timbrel arch" vault construction, and a March 1907 photo showing the Guastavino Company's building of the wooden arch forms over the Cannon Building sub-basement rotunda. The tile dome's design was as simple as it was graceful: nine sunken wedges containing cream-colored laminated tiles styled in a herringbone pattern, separated by radiating ribs, and all joined by a center ring. Using four layers of tile and Portland cement (a quick-setting mortar), the vault was most likely constructed in only a matter of months. Work on the grand rotunda above then continued with the pouring of a concrete bed for the marble floor. 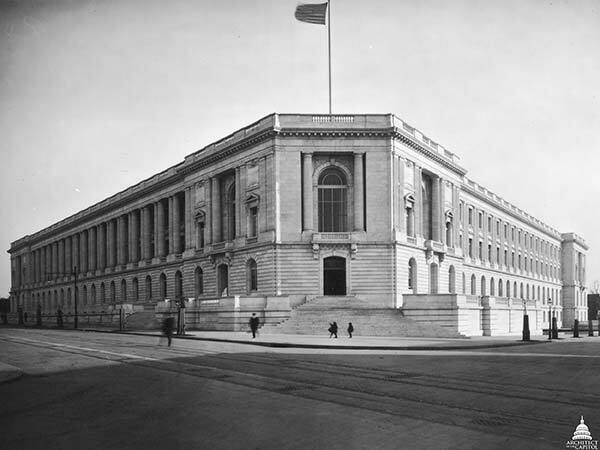 With Guastavino Sr.'s unexpected death in early 1908, he would have never seen the completed Cannon Building, which officially opened its doors on December 12, 1908. By the start of the Cannon Renewal's Phase 1 in 2017, the United States had more than 308 million people and a total of 50 states. In the Cannon Building, after more than 100 years of use, layers of grime had accumulated on the tile vaulted ceiling of the Guastavino basement rotunda. Cigarette smoke, grease from a nearby kitchen and constant daily use of the historic space had taken their toll. Over the years, the cream-colored tiles had faded to a dingy kaleidoscope of browns, and the original color was lost to history. 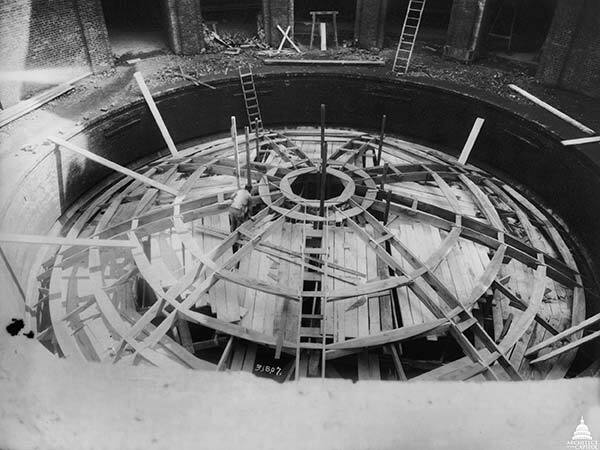 Despite the overall discoloration, the basement rotunda dome was found to be structurally sound at the start of the Renewal project. While much of the Renewal project focuses on upgrading the failing infrastructure systems, the historic preservation of the building's original elements is a key objective of the Renewal's mission. The essence of historic preservation is the process of retaining, restoring and rehabilitating a building's historic fabric to allow future generations to learn from the past and preserve history. This important work includes restoring historic elements such as the Cannon Building's Guastavino rotunda ceiling. "The Guastavino tile vaulted ceiling remains intact as it was originally constructed in 1907," explained Architect of the Capitol (AOC) Historic Preservation Officer Mary Oehrlein. "As part of the Cannon Renewal, the ceiling tile was cleaned and minor repairs were made. Additionally, the cove lighting was replaced with LEDs and the rotunda walls were repainted." After workers sprayed a latex poultice on the tiles and let it dry, the poultice adhered to the accumulated dirt and dust. 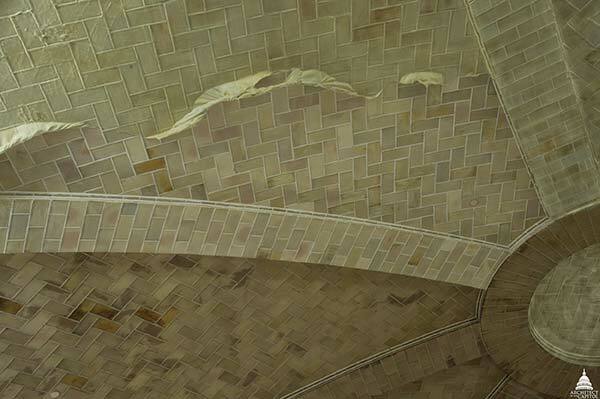 Once the latex was peeled back, it revealed the original color of the Guastavino tile. After conducting extensive research on how to safely clean the porous terra cotta tile, the Cannon Renewal project team directed the contractor to test the cleaning method on a small section of the ceiling. The results were dramatic. "The workers sprayed a latex poultice on the tiles, then once dry, peeled it back from the tile," said Cannon Renewal Senior Project Manager Donna Klee. Klee has supervised the Renewal's historic preservation work for the past four years. "It was amazing to see how the poultice was able to remove those 100 years of grime without disturbing the texture of the tile or the original grouting system," she said. "I think everyone who walks through that space will be really impressed." Ultimately, the Cannon Renewal project was able to achieve its goal for the Guastavino rotunda dome: safely preserve a priceless piece of America's cultural heritage using the latest historic preservation technology. 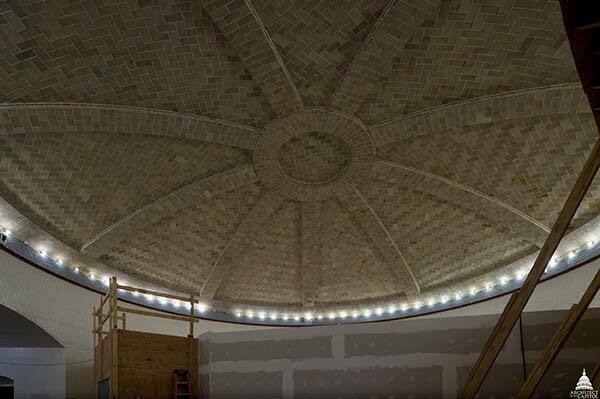 The historic character of the Guastavino rotunda dome has been preserved for future generations. 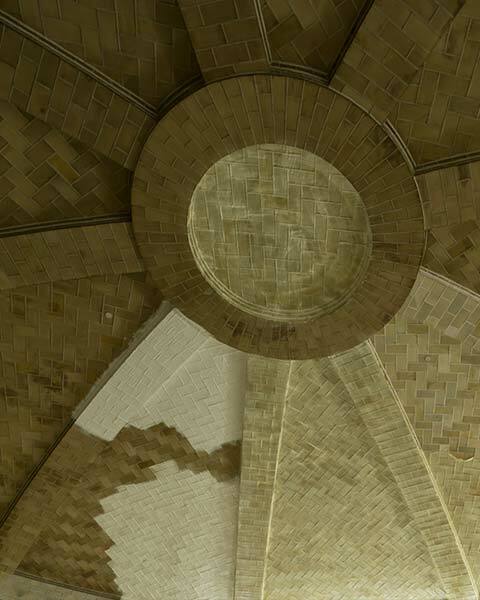 "The brilliance of the Guastavino rotunda dome cannot be understated," said AOC Preservation Architect Marty Shore. Shore has studied the dome extensively and has given presentations on its history and construction. "The dome the Guastavino Company created for the Cannon Building is an excellent example of the skilled craftsmanship and technology of that time. The design was both economical and beautiful. Simply put, we could not do this as easily today." After a steady decline in business due to changing tastes and new building practices, the Gustavino Company closed in 1962. While the art of structural tile vaulting may be considered a relic of history, the Guastavino legacy lives on throughout the United States and especially in the nation's capital. The work of the Cannon Renewal project ensures that legacy will continue to shine in the Cannon Building. The best way to describe this preservation is "WOW" Thank you for this insight. Very interesting article about Guastavino and his unique system used here at the AOC over 100 years ago. The restoration of the Cannon basement rotunda is wonderful. Thank you for bringing it to my attention!